Recently, General André Cox visited the southern part of the United States for an annual gathering of The Salvation Army. 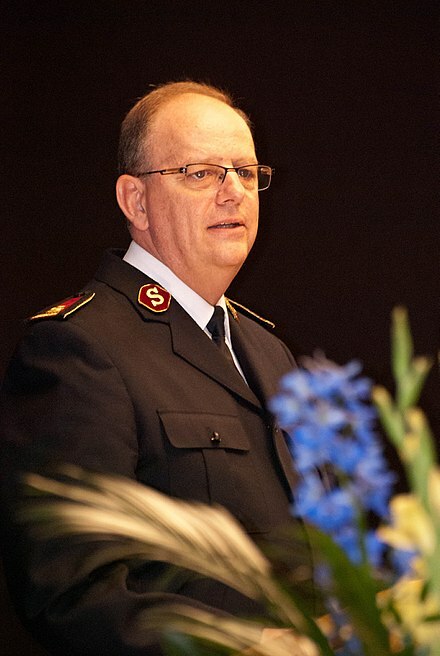 General Cox is the 20th General of The Salvation Army. As General, he is the international leader of the Army. He was elected into office on August 3, 2013. You can find some more detail about General Cox by clicking here. In observing the actions of the General while on stage and some while not on stage, there were five lessons that I learned that weekend. Throughout the whole weekend, I saw the General differ to local leadership in all areas. He never presumed a position or looked for an opportunity to assert himself into a situation. He was part of the experience. He did not make the experience about him. As an international leader, there is a certain amount of “pomp and circumstance” that surrounds a visit. Finding out that the General stayed at the Training School with the cadets (student ministers) spoke volumes about his character. The General appears to be a person who enjoys humor and likes to laugh. Whether it was spending time with kids or laughing with those around him, the General laughed and laughed often. He showed his emotions where it was appropriate. There were serious times, but there were also lighter time. He was himself during both times. The General did not shy away from what needed to be done or said. If he felt led to say something, he did. He was encouraging and full of praise for the Army in the South. But, he also challenged us to do more, love more, grow more, worship more, pray more, and be led by God more! In a day where leaders do not often say what needs to be said because of concerns of popularity, General Cox increased his popularity by saying what needed to be said! He was honest, brave, and compassionate. Along with the General, his wife, Commissioner Silvia Cox, also visited the southern states. She was just as much a part of what was happening as he was. Although they hold different ranks based on Army tradition, he admitted many times that she was valued and that, at home, she was in charge! While not expressing outward displays of affection for the camera, the General’s love for his wife was evident in how he walked with her, talked to her, and shared the experience with her. She was not an afterthought! She was a priority! The General must have taken hundreds of pictures with people during the weekend. In fact, it became quite the in vogue thing to have a “selfie” with the General. From whole families to individuals to groups to children, the General smiled in each and every one of them. Not being much of a “selfie” person myself, it was not one of the goals of my weekend. I did have the opportunity to shake his hand briefly during Saturday afternoon. He looked me in the eye and said, “Hello.” He did not look beyond me to the next person. He did not look for an aide to move me along. He did not look at his watch in concern for his schedule. He looked me in the eye. He took the time for every person he came in contact with that weekend. I was very impressed with the General’ visit. If you are interested, you can view some of his messages from the weekend by clicking here. What other things did people notice about his visit or know about him from previous visits? Great points, Doug! Hopefully, we in the Southern Territory will put these points into action in our corps and communities! Thanks, Steve! I agree with you. I found the General to be a good example of strong, intentional leadership. We need more of this in the Army!